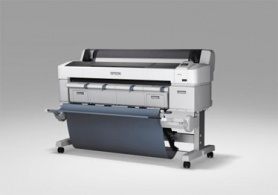 Wednesday the 23rd of April saw a mass release of new large format printers into the market, alongside the release of the HP Latex and Designjet Series, Epson launched their new range of technical printers. The new printers are the Epson SureColor SC-T7200, SureColor SC-T5200 and the SureColor SC-T3200, all come in a variety of print widths and integrate scanning and printing for the first time. Designed for use with CAD and GIS applications within design, commercial print, copy shop, architecture, building, engineering, retail and education environments. In recognition of the markets need for productivity and flexibility both the SureColor SC-T7200D and the SC-T5200D feature a dual media roll system with auto paper loading and auto switching. While the SC-T7200MFP and SC-T5200 come with a 36in large format scanner enabling users to digitise large format prints and hard copies with scan to file, scan to print and scan to email. An A1 original can be scanned and printed all within 39 seconds. The smaller SureColor SC-T3200 series has been designed for small offices and teams, the printer has a small footprint to seamlessly integrate with current workflows and enable users to increase their productivity.